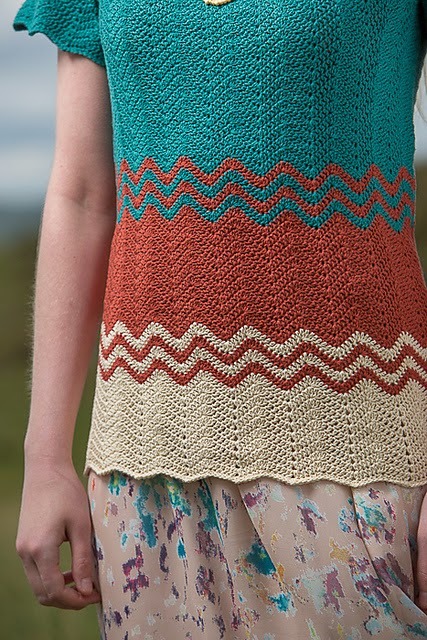 Have you seen my Sierra Sweater in the recent Crochetscene issue out from Interweave Crochet? This one is for those who saw the Dancette Dress I did for the summer issue, and asked for an adult version. I was actually so inspired by making the original dress for my daughter that I wanted to make myself a top using the same top-down chevron style. My original used only two colors, skipping the changes in the middle. But when they suggested 3-colors, I wanted the zig-zags of the first color changes to begin lower than they did on the dress, so they would fall well below the bust line. I also considered adding some of the lower colors on the sleeves, but decided I like the simplicity of one color on the sleeves. Another big difference from the girl's dress are the sleeves. I wanted to provide a little more coverage than simple sleeve-caps for an adult top. 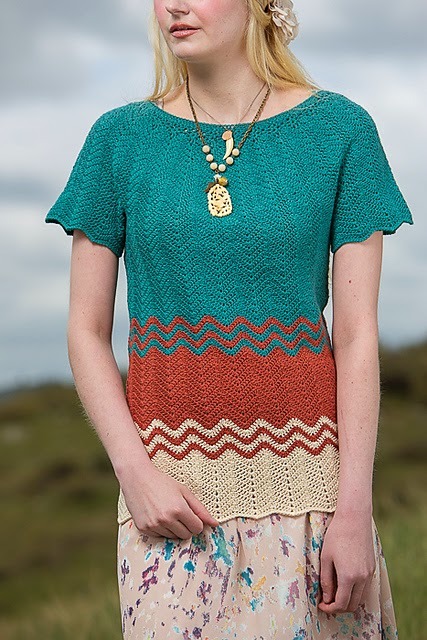 When Interweave first posted the preview photos of this issue, I was so excited to see how well the sleeves fit the model! I am nowhere near the size small of the sample, and trying a sample on my dress form as I go is nothing like seeing it on an actual human. This was actually my first garment design with sleeves. I made my original version in a larger size for myself. But the yarn was a bit heavier weight, so I had to make several adjustments. The biggest adjustment was the waist shaping (another design first for me). I have always understood the basic concepts of shaping, but my first few garments have been for little girls and lacy tanks with a lot of stretch that did not need shaping. The fun challenge of shaping in chevrons (or really any stitch pattern) is working out how and where to decrease and increase your stitches without interfering with the look and feel of the fabric. In this case, I did all the shaping in just the chevron right under each armhole, where it is far less noticeable and often covered by your arms. Although if you look closely at the photo above, can you spot the slightly smaller chevron second from the right?